Pallet scale (also known as shipping scale or receiving scale) is an umbrella term used to describe a group of weighing scales used specifically for weighing crates and pallets of produce or goods in warehouse environments. Receiving and shipping scales typically have large weighing capacities and pan sizes, and are custom built for use in distribution warehouses, factories and logistics facilities. Weighing scales within this category include weigh bars (pallet beams), pallet truck scales (forklift scales) and platform scales. Scaletec offers a selection of heavy duty shipping and receiving scales with up to 3000kg weight capacity. If you would like more information about the weighing scales we offer then please contact us. AELP pallet beams are versatile, easy-to-use and move, with built-in wheels and handles for mobility. Perfect for weighing large or oversized objects and pallets. This product can also be combined with cages, platforms or cattle crush for weighing cattle or zoo animals. 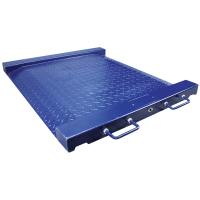 Adam Equipment's PT platform scale is a solidly, mild steel-constructed platform designed for weighing pallets, crates and large containers in warehouses or on loading docks. 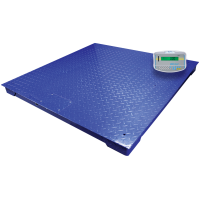 These platforms can be combined with Adam counting and weight indicators for performing parts counting, checkweighing and dynamic/ animal weighing functions. 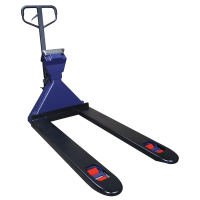 The PTS Pallet truck scale offers an easy and cost-efficient way to manage, move and weigh heavy loads. Heavy-duty reinforced steel pallet forks are generously sized and provide durable lifting capabilities. Ideal for commercial warehouses. shipping, distribution and production facilities. Adam's PTM steel drum scale is a low-profile weighing platform and compatible indicator used for checkweighing barrels, kegs and steel drums. The easy access ramps on both sides offers smooth transitions from the floor to the weighing platform in distilleries, factories and vineyard storage cellars. Q: How to calibrate a pallet scale? 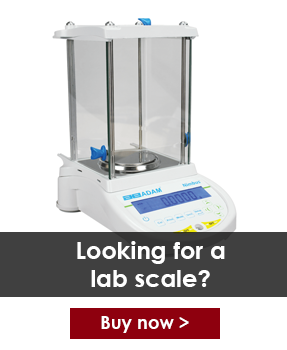 A: A Pallet scales include large weight capacities and platform sizes, therefore they require high-capacity calibration block test weights rather than standard calibration weights used on typical bench type scales. 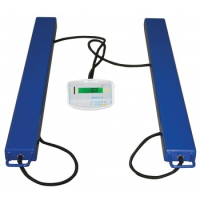 To calibrate your pallet scale or platform, you will need to ensure that the weighing pan/base is connected to a weight indicator using an RS232 connection cable. Once connected, place the block test weights onto the weighing pan one at a time, comparing the weight value on the indicator display to the mass of the weight to ensure this correlates correctly. We recommend following the procedure of adding and removing weights at least five times moving in descending order from weights with high mass to lower mass weights. For example, 50kg, 20kg, 10kg, 5kg and then 2kg.